You are presented with a list of all possible suggestions, from which you can choose a word to replace the wrong one. 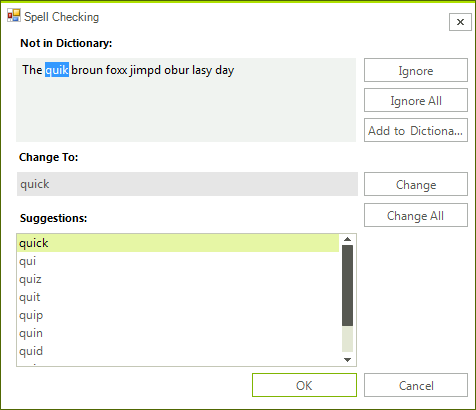 Alternatively, you can ignore the word or add it to a custom dictionary. This dialog will be called on every word considered wrong. 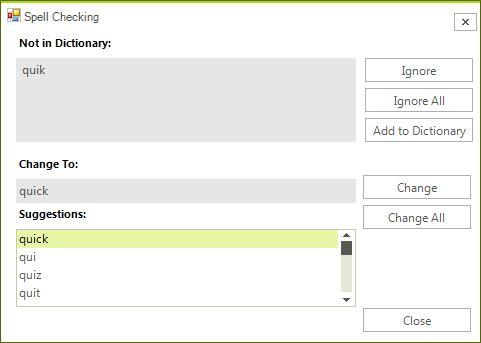 SpellCheckMode.WordByWord is the default value of the SpellCheckMode property so unless you have a complex scenario where you need to go from WordByWord to AllAtOnce and back, you do not need to set the property. You are presented with the same options as the WordByWord mode. The difference is that the entire spellchecking is executed in this window and only after that the content is transferred to the original control being spellchecked.